Swinglift side loaders consist of lift modules or cranes. These are fitted to a trailer chassis or subframe mounted on a truck. The modules incorporate outstanding wide reach, stabilizer legs, and jibs. These are controlled by a hydraulic system and powered by an Auxiliary Power Unit (APU) or the tractor’s power take-off system (PTO). Our lift modules are constructed from quality, proven high tensile steel giving extreme strength. They slide smoothly in or out for 20’, 40’ or 45’ positions. This combination makes Swinglift side loader range the safest, strongest side loaders available in the market. Original or unique Lattice chassis which is the industry preferred standard, giving a very low tare weight while maintaining excellent strength. I-Beam chassis which was introduced to provide customers with an alternative benchmark when comparing with alternative brand side loaders. Transferring to and from a Swinglift side loader to a skeletal or flat-topped truck is straightforward. 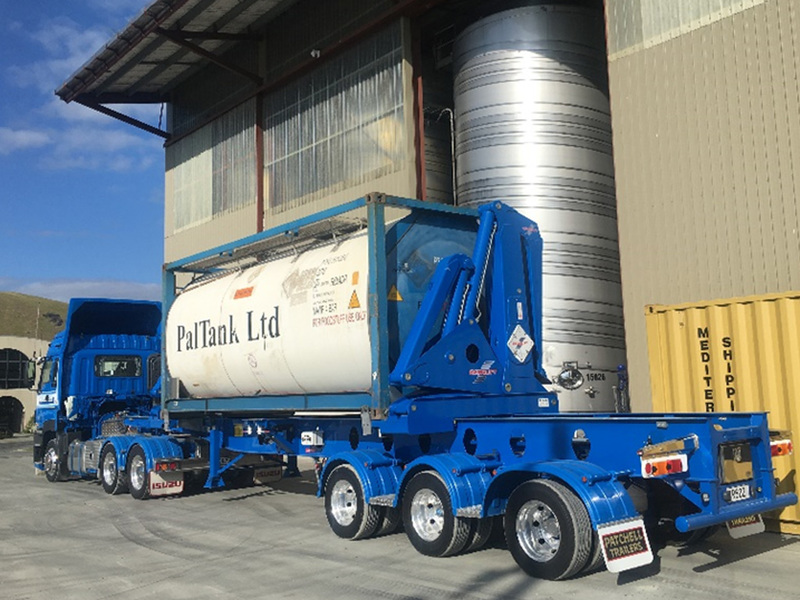 When the stabilizers are extended there is ample room for a truck to back into position under the stabilizers for loading or the stabilizers can be lowered after the skeletal or flat-topped trailer is in position alongside. 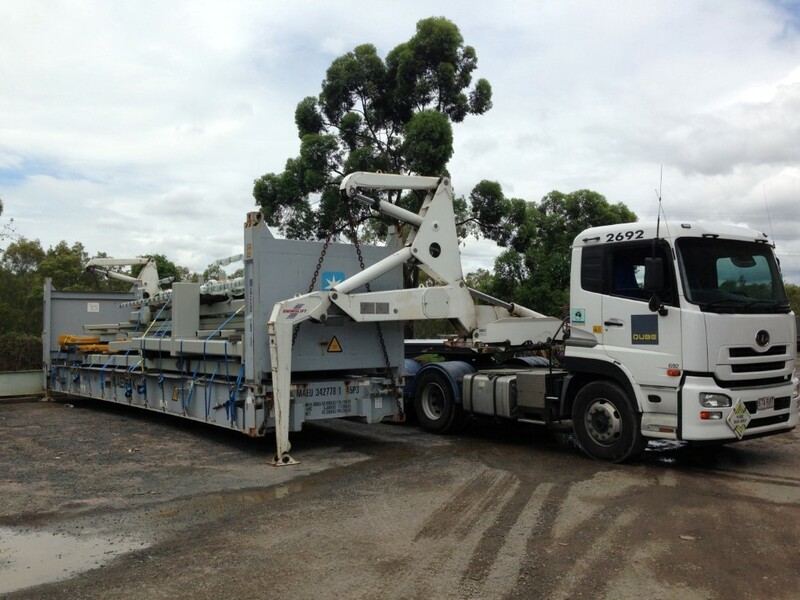 Over 300mm clearance is available each side of the transferring trailer. Faster turnaround time from start to finish than other side loaders and faster container transfer from trailer to trailer even when the Swinglift side loader itself is loaded with a container. Can transfer to a Quad axle trailer coupled to a four-axle tractor without having to jackknife the adjoining truck and Quad axle trailer. The lift modules do not need to place their stabiliser legs on the adjoining trailer or rail wagon to obtain stability. Swinglift can handle containers up to 9’6” high. The wide span of the stabilizer leg and outboard jib pivot provide fast, safe operation even under difficult conditions. Because of its high stability, the Swinglift side loader is able to lift up to 40-tonne balanced containers under adverse conditions. Container transfer is quick and safe. The centre of the container mass is always at least 1 metre within the line of stabilizer support. In other container side loaders, the container mass passes outside the stabilizer support making it less stable. The unique Swinglift “Leg-over”® design offers greater stability than other leg designs that extend downwards triangularly from the lift modules which can act as fulcrum points that tend to tip a side loader over when handling heavy containers. Swinglift is the safest and lightest tare container side loader available in the marketplace, regardless of whether lifting empty 20’ or heavy 40’ containers. Our HC4020 Swinglift has the greatest payload capacity. The light, well-engineered ultra-high-tensile lift modules and chassis result in an exceptionally low tare weight. This sits well below tare of other side loaders. Advantages of the Swinglift low tare weight are payloads well above those of other side loaders. Swinglift Leg Over stabilisers have been designed and proven for more than 40 years, eliminating failure during the loading or unloading of heavy containers in tight spaces. With the leg angled in heavy containers can be lifted or placed alongside walls, container or any other area where space is limited. 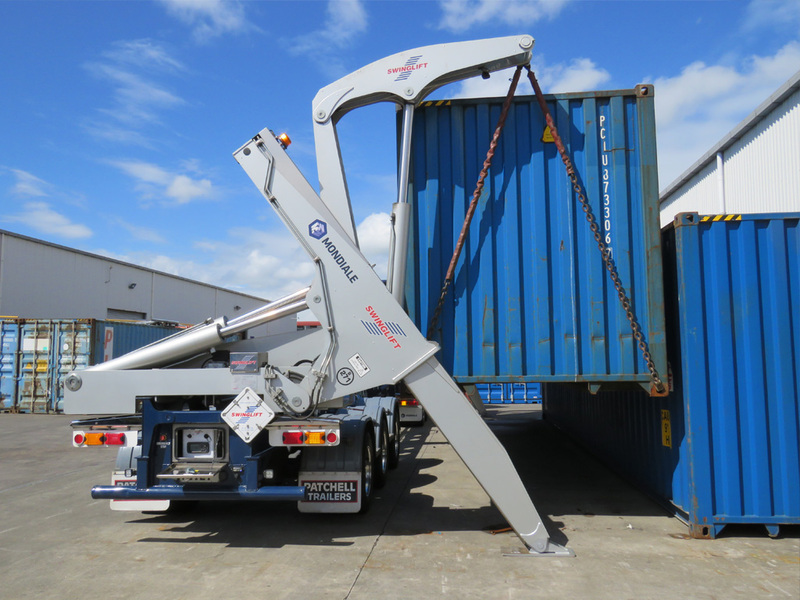 The Swinglift Dagger Leg model with “Dual Carriage” side by side crane and stabiliser geometry gives easier close container pick up or drop off. Compact and easy to use remote, designed for one hand operation. This makes a safe working environment for the operator. The radio controlled system allows for movement of both lift modules using a single button. Fast speed for quick operation or slow speed for precise and accurate positioning of containers. 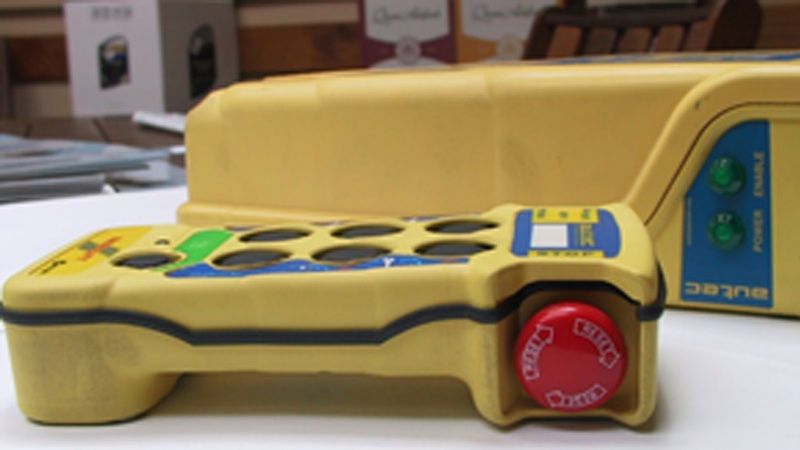 Dual carriage models feature a fully proportional control system with toggle operated remote control unit. 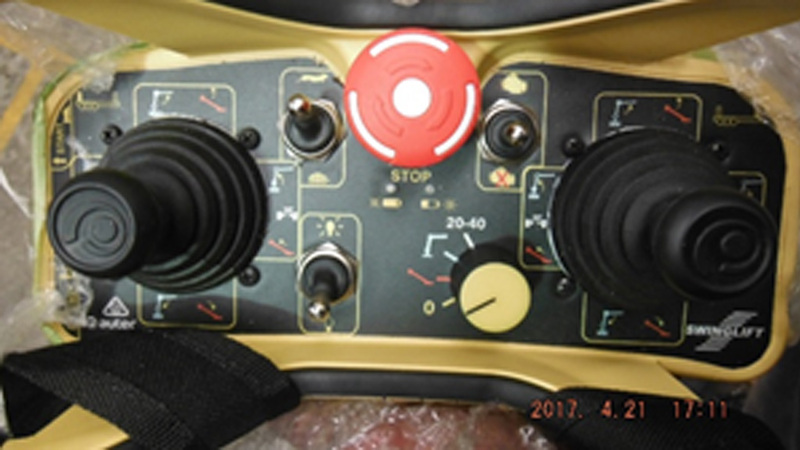 This enables the operator to directly control the speed and direction of the crane movement.